Hello to Mr MaGoo’s readers, I realize that Mr MaGoo normally does the blogging, today though I wanted to share with you an important and exciting journey of a one pit bull that entered my life by complete surprise. On the morning of December 19th, I started the morning like any other morning, which encompassed walking Mr MaGoo, Carla Mae and Mini Me. However this morning was about to change my future; as we rounded the corner, there stood a skinny, pit bull that was about as surprised to see us as we were her. As with any stray dog, need to use caution, yet with a confident approach; I kept my pack moving forward and it was at the very moment, I realized she was scared of us. That is when I was bound and determined to get her off the streets, it was obvious that she had not had food in some time. During the next several hours, I kept trying to get her in my yard; I quickly discovered that she was very social with other dogs and decided to use Carla Mae to help me. Meanwhile, neighbors had called both animal control and the police to capture her, they showed up and I explained that I am getting close in securing her in my yard. After a very long day, twelve hours later to be exact, she was secured in my yard. When I finally had her, I looked up at the sky and saw all the stars just came out and I thanked God for helping me. I looked down at her, noticed a “T” on her chest, sat on the floor whispered to her: “Twinkle, twinkle little star/How I wonder what (who) you are/Up above the world so high/Like a diamond in the sky“. Yes! Twinkle Star is her name until her owners come for her! Twinkle Star spent the night with me and it was not a restful night for either one of us; she didn’t want to be alone, so I slept on the floor by her down in the kitchen. Since I wasn’t sure about her behavior, I wanted to keep her in a secure place overnight and that meant the kitchen. Once I settled on the floor for the night, she fell right to sleep by me. In the morning, quickly discovered she was not leashed trained, so much for a walk around the neighborhood to see if her parents were looking for her. I had no choice but to call the officers from the previous day to come and get her; this was not the best feeling I had, my gut was telling me that no one would come for her and the worse would happen to her. A few hours later, the officer came from her, I stood there crying and promising her that I would get her out of there, I was going to get help. The officer explained to me that they would hold her for five days, after that she would be given an assessment for adoption. All I heard was five days and an assessment, I have little time, I have lots of determination, and I made Twinkle Star a promise. After day three, I went to the shelter to see if I could see her, wasn’t allowed to see her since I wasn’t the owner. I begged them to take my information and day five to call me; folks, I had no plan and figured I would cross that bridge when it arrived. I left the shelter crying, I had a gut feeling that if I didn’t get help, she would get lost in the system and put to sleep. You see, Twinkle Star was scared and very gentle, that she would be overlooked. That afternoon I reached out to anyone and everyone I knew with no emails returned. That is until day four, day four was Christmas Eve; I received an email stating “Merry Christmas”, I scrolled down and Twinkle Star was pulled from the center by Humane Society Silicon Valley (HSSV). She was given a chance! My prayers were answered, called a very good friend that was helping me find her a placement; needless to say, we were crying like two high school girls. Yes, miracles do happen! Or, should I say, Santa Claus does exisit?! Twinkle Star after the holidays was placed in a loving foster home, her foster mom Barb, provided updates and while Twinkle Star was not with me, I still felt connected. Over the week, Barb gave her a new name Sophie; much easier for Sophie to respond to vs Twinkle Star. 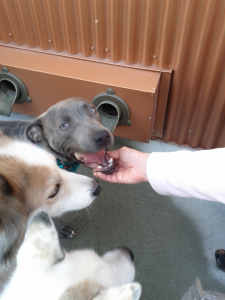 HSSV determined that Sophie was a pit bull mix and at best one year old, nevertheless, both HSSV and Barb had hope for her. Sophie had been in Barb’s home for about two weeks, she was coming out of her shell, progressing at nice pace and gaining confidence. Then, mid January Barb wrote that Sophie appeared to take several steps backwards; for Sophie’s rehabilitation, was determined to bring Sophie back to HSSV for additional assessment. Upon Sophie’s return, I was contacted to see if I had any insight to share that might help HSSV determine next steps. For Sophie’s rehab, it would take a village to help her gain trust and confidence; both Barb and I agreed to come in, sit with Sophie and hand feed her, we both had the “whatever it takes” attitude. Barb had to leave town due to business travel (Mr MaGoo’s pet peeve with me, excuse the pun), I stepped in to cover the first four days. What I would like to share, are the notes of this incredible experience; it truly was a big honor to be included with Sophie’s rehab. All I can say, priceless. Hey Mom! I am ready to go to work. Woofee I have a job! It was suggested that I bring Carla Mae along with me to HSSV to see if Sophie recognized her. Carla Mae and I pull up, I leaned down to Carla Mae, whispered to her that she is going to help with an important job today. We walk in, taken to where Sophie was staying and the moment of truth has come, did Sophie recognize Carla Mae? Not only did she recognize Carla Mae, she became playful. My heart just melted at that point; not sure if I was proud of Sophie; Carla Mae or both, needless to say, my heart just melted. 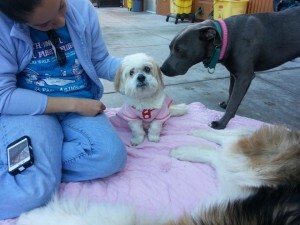 Another volunteer was there, her and I sat on the blanket for the hour, allowing the dogs to settle. Sophie throughout the visit began to relax; she was beginning to hold her tail high! Sophie at one point came over to me, put her nose to mind and gave me a “nose kiss” (no licking, just nose to nose); the volunteer stated it was if Sophie recognized me too and just said “thank you”. What a moment that I will never forget. Dinner time around and it was time for me to hand feed Sophie. Carla Mae and I went in to Sophie’s space, holding her bowl. Sophie was in her crate and I sat in the middle of the blankets, not beside the crate, thus “forcing her” to step out. I scooped a small amount, held my hand by my side (not in the crate); she stepped out to take the food. I kept repeating this several times, she kept coming out of her crate; she began her journey about trust. I looked at the bowl and decided to see if she would eat out of my lap, forcing her out of her crate. Woohoooooo she did!!! She ate the rest of her dinner out of my lap. What a beautiful way to end the first day. Carla Mae was unable to attend today, she had a grooming appointment, nevertheless, I was excited for another wonderful day with Sophie. Let’s just say, Sophie delivered “wonderful” and then some. Sophie for a very brief moment of time found the puppy inside her and was playing with me and herself. She would run back and forth very fast, came running over to me, jump on me (almost knocked me down) only to take off running full speed. It was a priceless moment. The trainer for HSSV was there and had her dogs there Raleigh and Chevy, as I mentioned earlier, Sophie is very dog friendly and we all agreed that she does relax much more with “friends” around. Plus, there were additional people with us today, the goal was to see Sophie’s reaction to multiple people, she did great. We wanted to give her time to relax; Sophie quickly learned to accept “cuddle time”. Adorable video to watch. The trainer decided to see if by using one of her dogs as a lead, could leash work begin today? The first step was to allow one of the trainer’s dogs, Raleigh, to lead Sophie around; at first Sophie gave some resistance, which lasted only about two minutes! Sophie was following Raleigh in less than 5 minutes; view this instant transformation. Thrilled with Sophie’s progress, time to try the leash; using a martingale, leash training began using Raleigh again as Sophie’s support. As they say, “seeing is believing”, amazing video of Sophie accepting the leash. All of this in 45 minutes! The hour visit ended with me sitting by her crate again, hand feeding her and just like the day before, she came out of her crate to eat. Talk about an incredible day! Woofee! I get to help Sophie (Twinkle Star) again! I am not certain which one of the two was more excited to go back to HSSV to help with Sophie’s rehab, Carla Mae or myself? While I have been assisting with Sophie’s progress, what has transpired that I did not expect was Carla Mae’s reaction. It is almost like she has found a fountain of youth; she has become very excited to go and when she comes home, she plays for a hour with Mini Me. They say dogs love jobs, Carla Mae validates this! 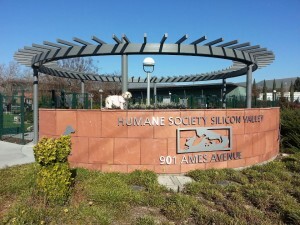 We arrive at HSSV, heading straight to go to work for Sophie. 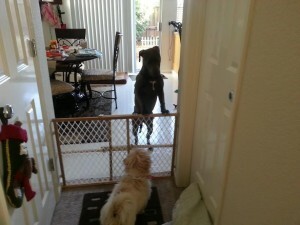 The trainer came in to with Chevy and Raleigh too, we wanted to review leash work with Sophie. After allowing all dogs to run around and “settle in”, we begin leash work, Sophie was a pro! She did not forget the pleasant experience from yesterday; decided to end on a great note and the rest of the visit was just to relax. We all sat on blankets, dogs and all, a very relaxed visit. And Carla Mae, she enjoyed every minute of it. Like the previous two day, the hour visit ended with me hand feeding Sophie. Today though, she didn’t even go in the crate, she was completely out for feeding. What is amazing, how quickly Sophie is responding and how resilient she has become! As I sat there with her doing feeding, wouldn’t it be great if we all just learned how to live in the moment and let go of the past. Sophie was brought in my for a reason, whatever that reason may be, I am ever so grateful for this unique experience with her transformation and the incredible staff at HSSV. Mom, Sophie is giving me kisses in my ear…it tickles Woof! I can’t believe that day four is here as Carla and I walk up to HSSV. Today, I was informed that it would be just Carla and I with Sophie. Since I was alone, I didn’t try any leash work as I didn’t want to jeopardize any of the positive and amazing work that was accomplished in the previous days. What I did was instead, decided to jog and see if Sophie would follow me as if we were on the leash. She did and became playful, at one point tried to jump up on me as we were jogging, view now. I had to grab this moment and video, while the video is shaky, certainly captured the moment. Speaking of playful, today there was something about Carla’s leash that she found interesting. Numerous times doing our hour visit, she would take Carla’s leash and try to bury it. Watch Sophie’s playful antics. She appeared to have a different energy today; not sure if it was anxiety or boredom, as she kept yawning and whining. I have to be fair and state this did not occur the whole hour, only when I would sit down to take a rest (have a bad cold, needed a break). As soon as I would engage in either the jog or pulling Carla’s leash along for her to grab, she settled into the moment. It was almost like she was ready to explore the world, ready to spread her wings and see what else is out there. In a way, she reminds of a free spirit. Today did the hand feeding with the same results. However today was different, when she was finished eating and once again she was very relaxed, went over to her water bowl, and drank from it with her back towards Carla and I. I sat in there for a little after her eating, she did not go in the crate immediately today; this time she sniffed the door, looked out the window. Since she was relaxed, I go to leave and she “walks” Carla and me to the door! I leaned down to say thank you and gave her a kiss on her head; she in turn licked my face. She just stood there watching Carla and I leave, I turned around to see her through the glass, there she is tilting her head to one side with her little brows raised. Wow! Talk about a moment that tugged at my heart strings. I thought I would share this journey and experience with all, why? Because if Sophie Twinkle Star was not given a chance, where would she be? The day I saw a pit bull standing in my path and elected to assume she was vicious because of her breed, where would she be today? If she had not had a village behind her that used positive, dedication, consistent training and attention, where would she be? It is only one month since Sophie Twinkle Star’s journey began and I am excited to share, she is almost ready for her furever home. Yes! She will be ready to find her furever home, very soon! I can tell you from the bottom of my heart, she indeed is a diamond in the sky. 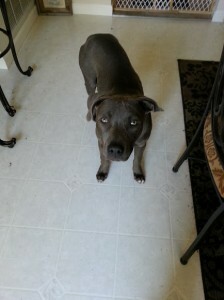 She is gentle, loves dogs, playful and will make a family very happy. 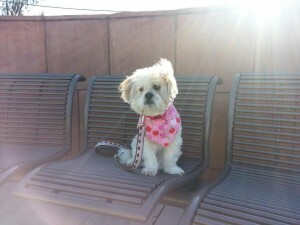 Both her foster mom, Barb, and I, are just amazed with her and are ever so grateful to the trainers at HSSV. HSSV did not give up on her when she regressed; the staff believed in her, gave her all the support she needed and above all, unconditionally. To all out there in Mr MaGoo’s world, when you may have a chance to rescue, please do so. I guarantee the experience is priceless, rewarding; remember, angels come in your life for reasons and some of those angels are pets in need. Adopt one today, perhaps Sophie Twinkle Star? Mr MaGoo will be back next week, thank you for following us.